All transactions are safe and secure with a reliable history in online purchasing behind each of our associates. 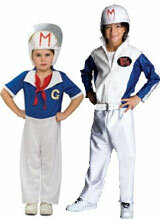 Buy the Speed Racer and Racer X Costumes to own Speed Racer clothing and merchandise. Cross the finish line in one of these official Speed Racer costumes that are available in both the classic retro TV style and the modern Speed Racer movie version. They ship with a white helmet that includes the red Speed Racer logo M on it. Speed's family and friends help him push his car to its limits as he tries to edge out his rival, Racer X, to earn the checkered flag. Speed would be helpless without the assistance of Trixie, Sprite, Chim-Chim, and Pops Racer, his father. Pair this costume with the Go Speed Racer Go shirt for the perfect merchandise combo. Racer X costumes are also available. In addition to the Speed Racer and Racer X Costumes above, browse the Speed Racer Clothing Gallery for more apparel like men's and women's clothes, kids shirts or hoodies.